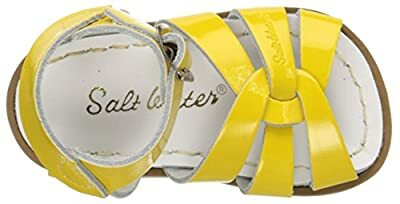 Salt-water® sandals have been cult classics for over 70 years, ever since walter hoy started making them with scrap leather from military boots during wartime shortages in 1944. they are the quintessential flat sandal still made with genuine leather uppers and little-way stitched rubber soles. they form to the shape of the foot with repeated wear, a process that hastens when wet. these versatile sandals combine comfort, fashion, and functionality, so they're perfect for wearing to the beach, splashing in the sea, pounding the pavement, or just hanging out. For sunny days and aquatic fun, The Original Salt Water sandal by Hoy is a must. This braided offering in water-friendly leather can be worn in or out of the drink so your good time doesn't stop to worry about ruining the shoes. A buckled ankle strap keeps The Original in place so you don't have to worry about their falling off, either.